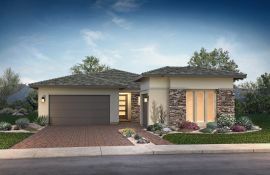 Centrally located in the heart of Gilbert, Arizona, in a quiet neighborhood within the 85295 zip code, just a half-mile from the San Tan/Loop 202 Freeway, Inspire at Recker Pointe is an outstanding location for your new home. Excellent shopping, dining, and entertainment are conveniently close at the SanTan Village Marketplace and the Heritage District in downtown Gilbert, as are several schools and multiple outdoor recreation opportunities. Impressive amenities like large parks, playgrounds, BBQs, basketball courts and a beautiful pool make it easy to connect with new friends and neighbors. Personalize your new home to fit your unique lifestyle with the ultimate flexibility of our award-winning, revolutionary Shea3D® concept. Starring high-end features like elaborate gourmet kitchens, premium finishes, and expansive lighting, the residences at Inspire at Recker Pointe create dynamic living spaces to fit your family.